Huggo's On The Rocks | Kailua Kona Casual DiningSuper Bowl LII at On the Rocks and Huggo's hBar! Super Bowl LII at On the Rocks and Huggo’s hBar! 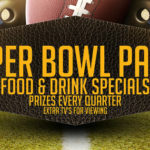 Super Bowl Sunday is ALMOST here and we wanted invite you to enjoy food, fun and prizes* with us and our friends next door at Huggo’s in their hBar! For the duration of the game (and beginning at 1pm! ), we”ll be serving Beef Hotdogs with your choice of three topping styles! We’ll also have a Quarter Pound burger, also available in two different styles! Both will be served with fries! Alongside our hotdogs and burgers we’ll have BBQ Pork Baby Back Riblets and Sriracha Chicken Wings! We’ll also have Coors Light, Bud Light, and Budweiser available! Because of all the drink and pupu specials for the game, we will not be running our normal happy hour specials on game day! Be sure to get your seats before the kick off at 1:30PM! If youʻre lucky, youʻll get to see some whales jumping in the ocean! *ONLY at On The Rocks!